Mommy, Esq. : Still Growing (Mostly)! Today was the kids' six month well visit - a good two weeks after they turned 6 months. Anyway, Nanny came with me because Husband is off on a college friends lost weekend. I just got off the phone and he claims he was drinking "spring water" but I think that is code for booze. He said something about a couples massage with his friend Nick so I'm sure that's the alcohol talking. Ned: weight - 17 lbs, 6 oz (50%); height - 26.5 inches (50%); head - 17 inches (25th). Given how big Husband's head is he's shocked Ned's is so small since Ned is a dead ringer for Husband. Penny: weight - 12 lbs, 11 oz (3% or less and down 1 oz from last Friday); height - 25.5 inches (10-25% - sounds really precise); head - 16 inches (10%). The kids didn't like when someone other than Nanny or Mommy was holding them even though they've seen the doctor and nurse numerous times. The doctor thinks they look healthy and she is definitely puzzled how happy Penny is despite not eating. Mommy, Esq. list of concerns included rash for Ned - turned out to be eczema so Aquaphor and some hydrocortizone. Penny has been constipated and since most pedi GIs usually recommend a stool softener we're starting her now so we can cross that off the list before our visit next week. And no more rice cereal - she prefers oatmeal anyway. Ned also has an almost imperceptible lazy eye - it's noticeable but I can't quite figure out which eye it is! The doctor thinks it is probably phantom but we are going to see an opthamologist just in case. Here is a little pictorial week in review. Our Nanny takes photos with the camera too! Work has been busy - if only I had enough time in my day to meet client demands, tuck the kids into bed and still watch American Idol. I'll let you all speculate which one didn't get done. Aw, cuties! And I think they give you that big range at the bottom to keep from freaking you out. Our pedi will say something like "Oh, he's in the 8th to 20th percentile". So, you mean 8th? Yes. She doesn't even try to fool me by saying something like "5th to 20th". Having a skinny-minnie is really stressful. I've always had two of them, which I think is actually easier since I don't have a "big" twin to compare against and further freak me out. Hang in there! Wow! Ned is almost as big as DS2 at his 9 month appt! DS2 is my little guy. I hope things turn around with Penny, I know she is happy, but we all want her growing too. So cute! 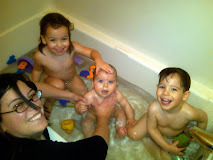 I love the little water play tub, I can't wait until mine are big enough to do all of those fun things with. Great photos! I'm totally stealing April's play ideas, you know! Hope to see you all soon!